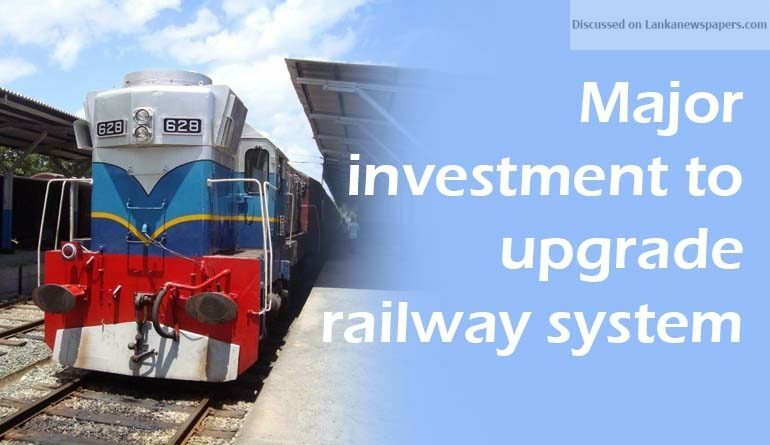 Sri Lanka is making a major investment in upgrading its railway system by importing new engines and wagons from Chinese and US companies, according to a top official. Sri Lanka Railways General Manager S.M. Abeywickreme said a Chinese company had been awarded a contract for US$ 80 million (Rs 12 billion) to deliver nine multiple units, each comprising an engine and eight to nine compartments with air-conditioning facilities. The compartments would have monitors displaying the next station and the time to reach the next destination. The delivery is expected by November this year. The engines and compartments will have a two-year warranty for mechanical parts and five year warrant for electrical parts. The Chinese company was selected by a worldwide tender. The Railways Chief said a second contract to buy 12 engines, each of them costing more than US$ 4 million, would be awarded to a US company. The project would cost about US$ 48 million (Rs seven billion). The delivery of the engines is expected within a year. He said these purchases were in addition to the purchase of six power sets, 10 engines, 30 oil tankers and 20 container type wagons to transport coal and flour and 160 compartments under a Indian credit line costing US$ 105 million (Rs 15.7 billion). The delivery of the engines and wagons is expected within this year.